Come into the Secret Garden, but be quiet. Secrets are hard to keep. And with fairies about, you have to be careful. 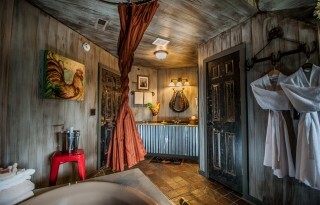 The Hayloft brings back a flood of memories to anyone who spent a weekend at a favorite aunt's or grandma's farm. If you know some state secrets, this would be an excellent place to share them with someone you love. Just whisper. You don't like the opera? Can't understand the lines? 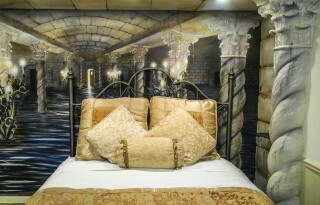 You'll catch every nuance in Anniversary Inn's Phantom of the Opera Suite. 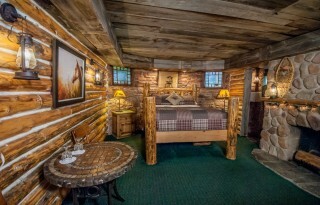 In the tradition of Jim Bridger or Jeremiah Johnson, the Mountain Hideaway lets you escape the traffic, noise, and congestion of modern life in your own wooded dreamland. Did Mark Twain stay here? If he had, he would have loved the queen-sized bed set on a raft and the waterfall shower in the jetted tub in the adjoining bathroom. 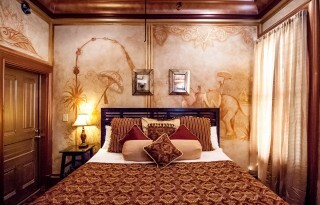 The Honeymoon Suite has romance written all over it, from its elegant 4-poster bed to the granite mantle fireplace. 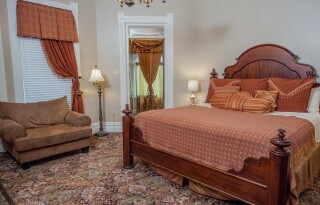 This Victorian style suite is decorated in warm tones that presents a welcoming atmosphere. 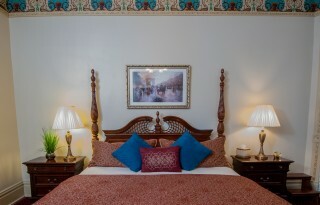 Lounge in the ornate four-poster king sized bed, or soak in the jetted tub surrounded by pillars. 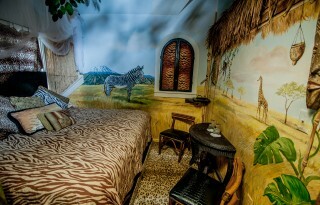 With an elephant's trunk for a shower, a crocodile at the entrance and wild beasts peering at you, the Jungle Safari Suite is for those with a sense of adventure. Looking for a 3,000-year-old treasure, a secret passage way or maybe an entrance to another world? Mysteries of Egypt takes you to another time and place where it's all believable. The magic carpet stops here in the Sultan's Palace! A beautiful room done in gold and umber and boasting The Inn's largest tub. You might want to bring a parasol or a panama hat, because spending time in the Savannah Nights Suite will make you feel like a character out of a Steinbeck novel. 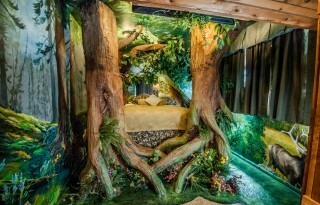 Forests are magical places, and The Anniversary Inn's Enchanted Forest is no exception. 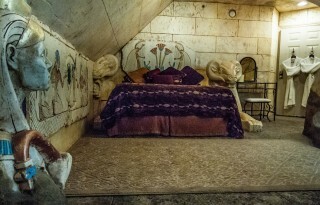 The bed is carved out of the trunks of four trees with a canopy of leaves and boughs overhead. The Anniversary Inn South Temple location sits in the historical Avenues section of Salt Lake City on South Temple and 7th East. The Victorian-style mansion was built in 1889 by Emmanuel Kahn and is on the National Historic Registry. It retains all of its charm and many of its original features. Each of its 13 luxury suites are designed around a specific theme providing our guests with a unique experience each time they stay with us. 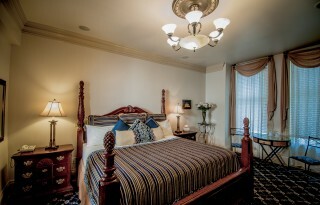 If you are looking for a touch of romance, you may want to stay in one of our elegant rooms, such as the Capitol Retreat or the Anniversary Inn Suite. 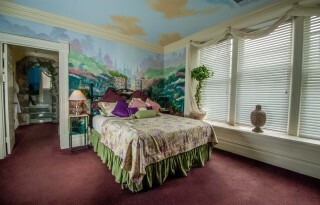 If you are looking for a hint of adventure, you may choose to sleep in the Mysteries of Egypt Suite, or the Enchanted Forest.